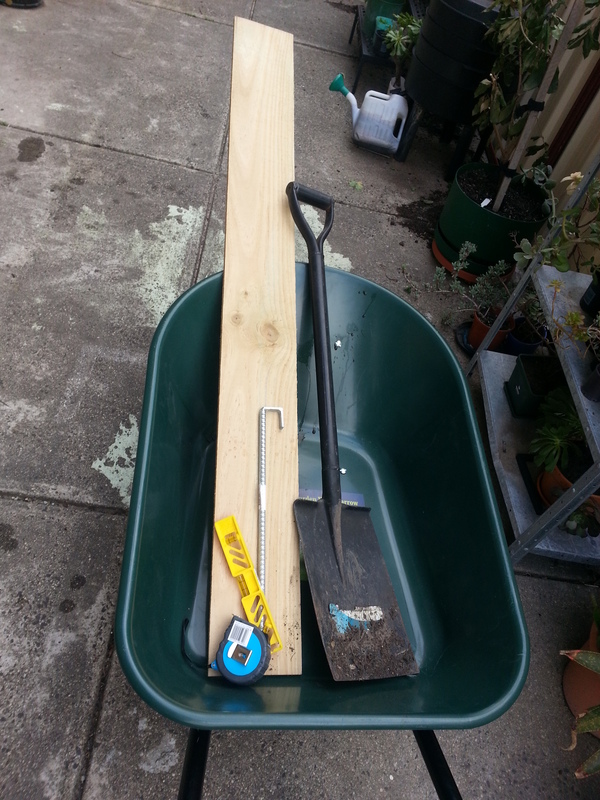 So, knowing I would need a wheel barrow to move the 3000L of Pine Bark required for this reno, I went to Bunnings to buy a cheap one…. By this stage in my life, I should know that buying the more expensive, pre-assemebeled, device is probably a better idea in the long run…. but seeing as my hyundai 2 door hatch back is being used to lug my landscaping supplies, sometimes pre- assemebeled is not an option. Now, I have to start by saying that the Wheel-barrow has come together pretty well…. but putting it together was not a pleasant experience. Firstly, when I opened the box and read the pre- assembly instructions – i found that successful assembly required 2 ‘saw-horses’! No mention of this on the outside of the box! grrrrr. 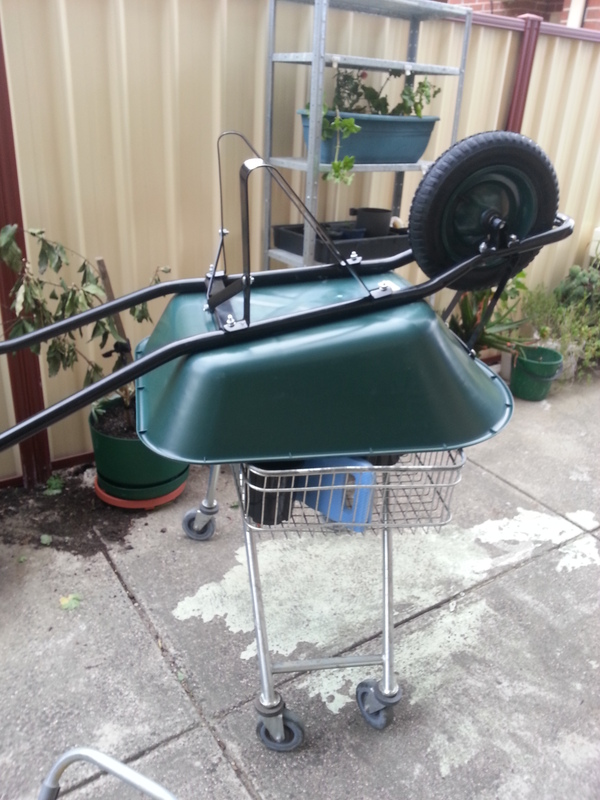 As an urban gardener, I don’t have much use for saw-horses (yet), but no shortage of abandoned shopping trolleys… so my ‘Gardening Trolley’ (yup – i keep one chained to the stairs ahahaha) was used in place of saw horses. The key difference here is that shopping trollies have free moving wheels. They don’t like to sit still while you assemble a wheelbarrow on top of them lol. I refuse to admit how long it took me to put together but it is now fully functional on ready for service. Thanks to a suggestion from John, I am also going to use a couple of ‘Wheelie bins’ that I borrow from the Flats to help move all that bark mulch. if anyone has advice on moving large amounts of pine bark… please let me know!